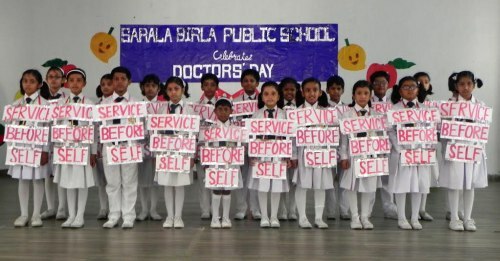 Every body knows that the Doctor’s day is observed to appreciate physicians across the world.However,the three- day celebration of the event begining June 29 ended on July 1 at Sarala Birla Public School in Ranchi. On June 29, the Class Recitation Competition(both in Hindi & English for students of KG to Std. II) was organised. Poems on the topic ‘Healthy Food’ were selected for reciting and students dressed as fruits and vegetables confidently participated. The main aim behind this move was inculcating the need of eating nutritious food for staying fit and healthy. On June 30 and July 1, a medical camp was arranged for the check up of the students, wherein they were given medical advice too. On July 1, students of Classes III to V along with their teachers gathered in the auditorium to celebrate the Doctor’s day with the students of Class III. singing a Group song, dance and skit.”It gave a vivid knowledge about healthy foods was the charm of the programme. It also carried the message of the selfless contribution of the people attached to this humble profession”,said a teacher. School Head,Personnel & Admin,Pradip Varma said that such celebrations acknowledge the dedicated contribution of the doctors “Also such activities in the school curriculum are appreciated by students as well”,he said. Acting Principal Neena Das felicitated the doctors by congratulating them for their extended support. She told the students about the ways to keep fit and remember that prevention is better than cure.